In 985, at the beginning of his reign as emperor at 17 years old, Kazan was mourning the death of his favourite consort. Kaneie, an ambitious politician of the Fujiwara family, tricked the emperor into taking the vows of a priest, in which case he would be forced to abdicate. Kaneie sent his son Michikane to give an emotional speech to Kazan, announcing that he himself was to become a priest and inviting Kazan to join him, although, in fact, he had no intention of going to the ceremony. 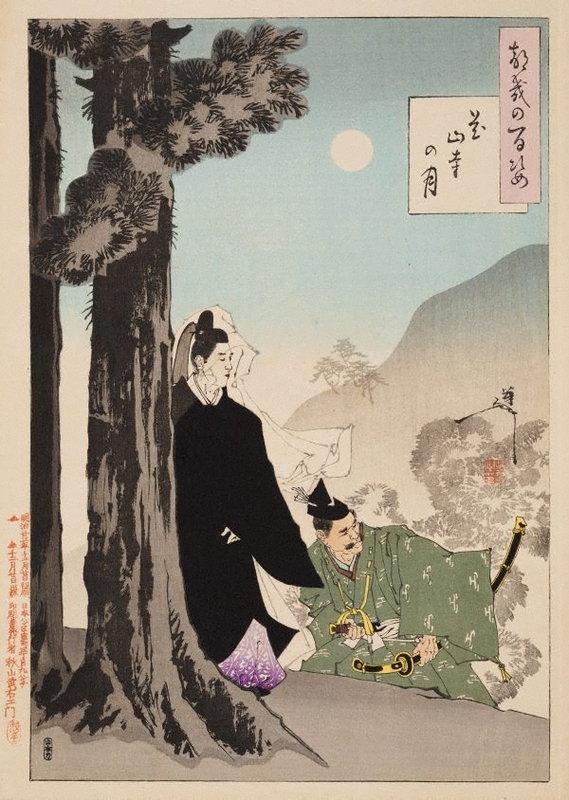 Kazan is shown here with a retainer on the way to Gangyō temple on a moonlit night so bright that he feared he would be discovered. Kazan became a priest and hence lost power.